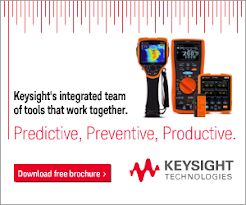 Keysight Handheld Test Tools Blog: How to Select the Right Handheld Oscilloscope? How to Select the Right Handheld Oscilloscope? If you are involved in electronics, you probably used an oscilloscope before. Today, owning an oscilloscope or replacing an existing oscilloscope has become more affordable and desirable as the price-performance of oscilloscope has improved significantly. There are many oscilloscopes out there in the market. No matter who you talk to, everyone will have a favorite brand or preference that they swear by. Selecting your handheld oscilloscope has to do with what you are looking for in a scope. Do you want something that is reliable and accurate, something that is rugged and durable, or something that is cheap and simple to use? In this post, I’ll go through the key factors that I think you should consider before making a buying decision. Every oscilloscope has a bandwidth-limited filter. This filter will attenuate or remove frequencies higher than the bandwidth designed in the trigger path, the acquisition path and the display path. When selecting an oscilloscope, the rule of thumb is to select one with a bandwidth of at least three times more than the highest frequency that has to be captured. To illustrate this point, below is a 20MHz square wave signal captured on a 20MHz and 200MHz oscilloscope respectively. Notice that when the measurement was done using an oscilloscope that has a bandwidth of equal or less than 3x the frequency of the signal, the shape of the signal is distorted. Figure 1. A 20MHz square wave signal on a 20MHz bandwidth Scope (left) and 200MHz bandwidth Scope (right). Let’s look at an example of two oscilloscopes that are sampling at 2GSa/s, but one with a memory depth of 10k points and another with 2M points. You would notice that the oscilloscope with a 10k points memory cannot sustain its maximum sampling rate as the acquisition time increased above certain value. On the other hand, the oscilloscope with a deeper memory can maintain its sampling rate over a longer period of time. Figures below show a same signal captured by oscilloscope with 10k points and 2M points respectively. Figure 2. Captured waveform using scope with 10k points of memory (left) and 2M points of memory (right). At a glance, the waveforms appear to be identical on both oscilloscopes. However, when you zoom in on both oscilloscopes, you would notice some details are missing on the oscilloscope with 10k points of memory. This will result in you not catching a glitch or overlooking an event that could be detrimental to the system you’re troubleshooting or evaluating. Figure 3. A zoom in on waveform captured on 10k points of memory (left) and 2M points of memory (right). Handheld oscilloscopes often come in single, dual or 4 channels. Single channel oscilloscopes offer a simple and lower ownership cost. However, dual and 4 channel oscilloscope are usually preferred as they let you see two or more signals simultaneously. Apart from input channels, oscilloscopes with a dedicated triggering channel offer an additional input terminal for triggering the oscilloscope to start making measurements. Imagine if you are measuring the phase delay of a differential output on an amplifier. You would need a dual channel oscilloscope at the very least and probably start the measurement through the oscilloscope’s triggering input. If your work involves making measurements on power control circuits such as uninterrupted power supplies, motor controllers and industrial equipment, floating measurements are not a strange to you. For those who are not involved in these areas, a floating measurement is defined as a measurement that is not ground referenced. When using a handheld oscilloscope to make floating measurements, you must ensure the oscilloscope has isolated channels. A handheld oscilloscope with isolated channels does not connect the outer layer of the input channels to ground directly and hence supports floating measurements. This reduces the risk of accidental short circuits and offers a wide range of applications. In case isolated channel’s oscilloscope is not available, be sure to use a differential probe to make differential measurement. Using a standard probe by connecting the ground connector of the standard probe to any of the floating points essentially pulls down the probed point to the earth ground, which often causes spikes or malfunctions on the circuit. Hence, a differential probe is used to look at signals that are referenced to each other instead of earth ground and to look at small signals in the presence of large DC offsets or other common signals such as power line noise. Safety rating is another important aspect to consider when choosing a handheld oscilloscope. Electrical test and measurement equipment are assigned to 4 different categories from I – IV. When it comes to selecting the right handheld oscilloscope, it’s really depends on the environment where you will be using your oscilloscope. If you find yourself making measurements on distribution boards, circuit breakers, or stationary motors with permanent connection to the fixed installation, then you are working in CAT III environments and require tools that are certified under this category or higher. For a list of Measurement Category, you may refer to American National Standard Institute website (www.ansi.org) for IEC 61010-1 Standards or simply jump to the Wikipedia at http://en.wikipedia.org/wiki/Measurement_category for a quick reference. Perhaps after considering the hard specs, the next factor to consider is the size and type of display on the handheld oscilloscope. Display may not be high on your list of priorities, but it is the thing you are going to stare at and displays all the details that the handheld oscilloscope captures, so it deserves a little thought. A handheld oscilloscope that offers a colorful display makes reading the waveform more comfortable. A high-resolution display and wider viewing angle is important to display more relevant information. For example, when you zoom into a particular area of a waveform, the ability to also view the overall waveform is a useful feature. Free bundled software comes as a plus for handheld tools such as oscilloscope. The software certainly will make your life a lot easier when you need to transfer the waveform and data captured to your computer for post analysis. Another plus point for handheld oscilloscopes is the additional built-in capability such as DMM and logger functions. These functions allow you to do more with one instrument and save you the hassle of carrying additional instruments while on the job site. These are the specs and features that you may want to consider up front. But, I would suggest you to also look at the intangibles such as warranty period, the level of support and the reputation of the brand that would also differ from one brand to another. Some brands do offer loaner units for you to evaluate. Try asking for one to test it out and do not forget to evaluate the bundle software for the handheld oscilloscope if it does come with one. I’m sure that whatever you decide to buy you will be happy with. If you need any help specifying a handheld scope or have questions just list them in the comments section below. Do share with us your experience with your handheld oscilloscope. We would love to hear your opinions too! Well written post. I will keep your ideas in mind. Talks about types of works and what good waveforms should look like as well as why they look the way they do. One of the cool things about the latest age group of oscilloscopes is that you can add digital logic ability to them and still keep costs down. Choosing the right oscilloscope within your budget is vital, because that is most likely one of the most useful and often-used tools on an electronics enthusiast’s bench. There are a number of different types of oscilloscopes, with hand-held scopes, Portable oscilloscopes and automotive oscilloscopes. Handheld oscilloscopes are able of showing in a digital or analog display. An analog oscilloscope gives stable wave form sign, in general in a luminous phosphor. Portable oscilloscopes are in general employed for checking in skill, engineering, telecoms, auto-research, and for heavy industry purposes. Automotive oscilloscopes are common tools in the automobile repair trade. In such case the automobile oscilloscope is your most needed tool. It is not enough that your oscilloscope is fast enough to take the fastest signal you will need to measure. There is a rising market for handheld oscilloscopes, which advise that scopes more and more find use in the field, not just in the lab. Some recent growths may affect the choice you make. And a quick checklist of tips and questions may help you make the right choice. If you need to learn the basics of oscilloscopes this is a clear book. Very good hint to known good wave forms. Which it went more in depth with bad wave forms but it just covers every sensor, actuator or solenoid out there. Well thank you for this great share. I could write a book on this topic, so I am sure they will come up again in a future post. I am at present giving custom essay service for my clients. Visit website to know more about the service. I would like to thank you for the hard work you have made in writing. I am hoping the same greatest work from you in the future as well.